Last night, I registered for Central Jersey 2013-2014 Heart Walk by the American Heart Association. I got involved last year and am so glad I did! I was able to raise $360 last year, so I am aiming a little higher and have set my goal for $400 this year. It’s unfortunate that I won’t be in New Jersey in October for the actual walk portion of it [my parents and I have made intention for Hajj, inshallah]. Will you help me help a great cause? July 16, 2005 started off as any other summer day. Except for the fact that we were busy planning Faraz’s high school graduation party to be held the following week on my birthday and we had family arriving from Canada that evening. I remember exactly what I was doing in my room when I found out and most of the details of the crazy day that followed. I remember hearing the confirmation it was an indeed a heart attack that my dad just had. I remember calling my brother Ayaz at work to tell him. I remember the questions and the dreaded what-ifs. I remember the wait while my dad was in surgery. Most of all, I remember the long road he faced in the aftermath to recovery. I remember it all like it was yesterday. I just can’t recall any warning signs. Maybe they weren’t there to begin with? That’s the scary part. It can happen out of nowhere. It can and it does. Just last year, for example, a cousin of mine in her twenties who lives in Europe had a cardiac arrest in the middle of the night! Her son was a toddler at that point, and to think if her husband hadn’t woken up when he did and essentially helped saved her life… you don’t even want to think of the possibilities. In her twenties?! Things like that can happen to someone relatively healthy in their twenties?! It’s just so unfathomable to even think about. That, in part, is one of the major reasons I took up this great cause. Not just because it effected my family, but because of how dire the situation can become in an instant and its consequences are not so great. But we can change that. Who knows, maybe in our lifetime, we will make great strides in the cause. But we have to come together for the cause first. Do our part. It cannot, and must not, be left on the back burner of issues. Each one of us, I’m sure, knows of multiple people effected by heart disease. The statistics are unnerving. It’s not just about donating towards such a wonderful cause, but also committing to making that lifestyle change. For ourselves, our well-being and health, and our family. Heart disease doesn’t just effect the individual, it effects the whole family. We need to start eating better, and living a healthier lifestyle … and just generally taking better care of ourselves. What’s the point of living if you are not going to live right? Some argue, what’s the point of living if you can’t “live a little”. Well, we all could live a little and live a little longer if we just started taking better care of ourselves. You know what else I remember? I remember the low sodium, bland boring no taste in any of the food diet that ensued following my dad’s heart attack. I don’t know how he ate it and for so long. Would you rather have to be on such a diet on a regular basis or would you rather eat healthy regularly but indulge once in a while? It’s not only about the food we eat [although it’s a large part], but is any food really worth failing health? I am scared of all bug related things, so when I just noticed two cicadas at my front door? Yeah, not going over so well. Several years back, I saw them through the safety of the car on a road trip down to Virginia to visit family. When we got there, cicadas were also there to welcome us unfortunately. The wimp in me would run from the house to the car and back. So far for this years invasion? We were lucky. I heard them scantly but had yet to see them in our area. I figured they would not be appearing in our area [hopefully]. And then tonight occurred. After putting the garbage and recycling items out, my brother came inside the house mentioning a big bug. Our mom asked, “it’s not a cicada is it?” jokingly to which he responded “it looked like one”. Half hour or so later, I opened the door and there they were. Large, gross, and flying way too close to my liking. Can they go away now? I came across this quote late one night last week when someone shared it on Facebook. It was in the middle of the night, but it got me thinking right away. It hasn’t left my mind since. Most of us live such a blessed life, that we often take for granted so many aspects of our lives. Our education? One of them. The roof over our head, the many clothes in our closets, and the plentiful food on the table being among some of the others. So many people go through the twelve years of mandatory schooling years and learn not a single thing. It’s not because they aren’t smart enough, but rather: they just don’t take it the opportunity seriously. People across the world? They would give anything for even an ounce of the education and knowledge we have been blessed to have the opportunity to take for granted. Then we get to college level education. Enter a-crazy-amount-of-loans-and-debts. For what? A job. And if you are lucky enough to even get a job: then, spend many years paying off aforementioned loans and debts. But what about those who can’t afford the education? Even after grants and scholarships, the loan I had to take out for a bachelors degree? Scary. Not to mention the fact that I still haven’t found a full-time job to even start paying it off. Makes you wonder how many brilliant people out there who can’t afford the education aren’t living up to their fullest potential. Because let’s face it: in this economy and job market — you need at least a bachelors degree to even have a chance at landing a decent job. So when I stumbled across the quote I began this post off with? That feeling of angst and annoyance and I don’t even know how to describe it… it’s been bothering me since. There just HAS to be a cure for cancer, HIV, and other deadly diseases. Can you imagine IF the ONLY thing holding the cure back is that someone wasn’t given the chance? Ill health effects us all – whether it’s you suffering, or a loved one… it doesn’t discriminate and effects all. The amount of money in your pocket should not dictate who you are and what you are capable of. Shouldn’t everyone have an equal chance to fulfill/maximize their potential? That’s not just the American dream… that’s the human(e) dream. So imagine my surprise when last night not only did I have a dream that I woke up remembering… but a very vivid one. Why couldn’t it be a pleasant one at least? It’s just my mom and I at home. I am in the kitchen, and suddenly hear we sirens that I somehow know is a tornado warning siren. In real life, I have never experienced it so I wouldn’t even know what it sounds like. I laugh it off to my mom, and then turn to face kitchen door. And what do I notice? VERY dark, like almost black [if not black] clouds near the back right side of my house. Oh, and a humongous funnel cloud that seems to be right at the tip of where our fence meets our backyard neighbor diagonally. And what do I do? I run upstairs to change. Yes, that’s exactly what I did. Even as I am changing, I can see it approaching by my window… inching closer and closer. The details? Not fuzzy. Just ridiculous. Mainly because who in their right mind goes to change their clothes in such circumstances. It’s just a dream. I know that. But do you ever wonder if they mean something more? No, I don’t mean that it signifies a crazy tornado happening in New Jersey. I certainly hope not! I mean, if it signifies something more? Like if the connotations mean something? P.S. Too late for it now, but are you not suppose to share good dreams or bad dreams? 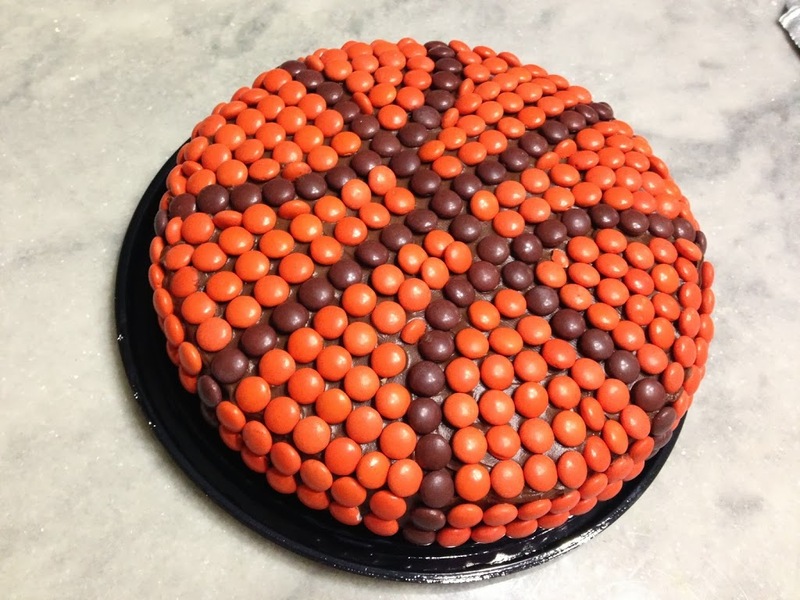 I’ve been having a major sweet tooth lately. Not exactly sure why. Although I was still super tired from the trip to Virginia, Monday was one of those days that I needed something sweet. Like at that very moment. The first thing that popped in my head? Chocolate chip cookie dough cheesecake squares. It’s something that’s been on my “to-do” list for a long while. Half way into the process, I just turned it into a cheesecake. I used my chocolate chip cookie recipe for the cookie dough portion of it. Preheat your oven to 325 degrees. Spray your [9-inch] [spring-form] pan with non-stick cooking spray. Start off with the crust: combine your melted butter and graham cracker crumbs. Add in the chocolate chips. Press your mixture into the bottom [and lower sides if you want] of your pan. Cream your cream cheese using your mixer before adding in the sugar, eggs and vanilla extract. Beat the mixture again until it is nice and smooth. Pour your mixture over the pressed crust layer. Next, start the batter for your cookie dough. I used my homemade chocolate chip cookie dough recipe, but you could use store-bought dough for convenience. 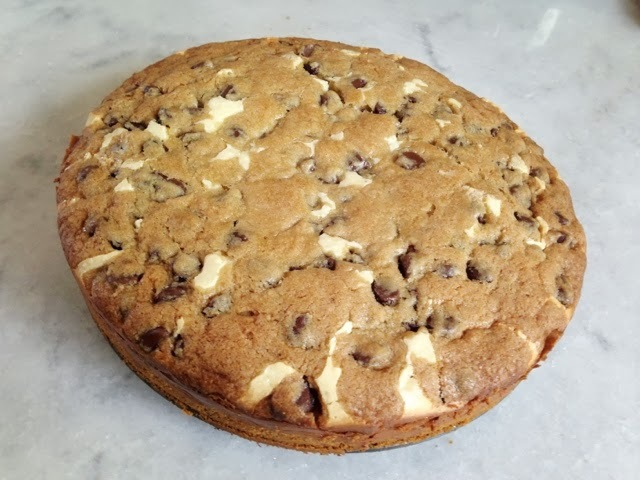 In small amounts, add the cookie dough batter on top of the cream cheese filling layer. You want to do this like a crumbled topping type of way. As the cookie dough bakes, it will spread. Bake in your preheated oven for 50 minutes. Let it cool before cutting into it so you give the cheesecake time to settle. I had a little leftover chocolate chip cookie dough, so with that I made cookies. So you know what I did this weekend? I locked the keys in the car. In the trunk. In a rental. In another state. Ugh. Oh and I managed to do this the night of my cousin’s, Naairah, graduation party. On the positive side, I guess it was a good thing that we were already at the hall, and we didn’t realize the mishap until near the end of the party. It was an innocent mistake, but I felt terrible. Paraphrasing my brother’s words: Niagara falls of tears were shed [by me]. I’m a crier. A big one. Happy moments, sad moments, mad moments. I guess add stupid moments too. My cousin, the graduate, needed to borrow blush. It was in my luggage in our rental, so I borrowed the keys from Faraz and we headed to car. Opened the trunk, took out bags covering my luggage, somehow managed to set the keys in the trunk in between, opened my luggage and dug out the blush. She used it, we put everything back in it’s place, shut the trunk with all my might [it was heavy!] and headed back in. No keys. Little did I know though at this time. It wasn’t until much later, near the end of the party, when Faraz asked my for the keys. My response? I don’t have the keys. His? Yes you do, you took them from me. Panic mode as I check my belongings and head back to the car. My thinking [or hope]? The trunk wouldn’t have locked with the keys in it. I immediately knew it was in the trunk because I remembered not coming back in with it. Especially because I used both hands to shut the trunk door. Nonetheless, we searched the hall, I retraced my steps, checked the bathroom, told the hotel workers [in case it showed up], etc. Finally, called Triple A who came to the rescue. A couple of hours later. It doesn’t end there though. When they get there, they tell my brother and dad that they don’t think the keys are locked in the car because if that was the case the car wouldn’t have locked [BMW 2013 model]. Yeah, well, that’s what I thought too. Oh, and the car alarm starts going off as soon as they unlocked the car through the back window. So my brother climbs in, and heads to the trunk, emptying our trunk… until finally: the key is found! And so all of this. And all because of blush. This will be a weekend to remember. Not just because my cousin graduated, or how great the keynote speakers were at her graduation (the best I’ve ever heard), or pretty much the whole family got together, or the crazy weather that first day… or anything like that: but because of the car. and blush. So the day of Sabih’s graduation party? It also happened to be my cousin Naairah’s birthday! Thursday we head off to Virginia for her graduation ceremony that day followed by her graduation party on Saturday. 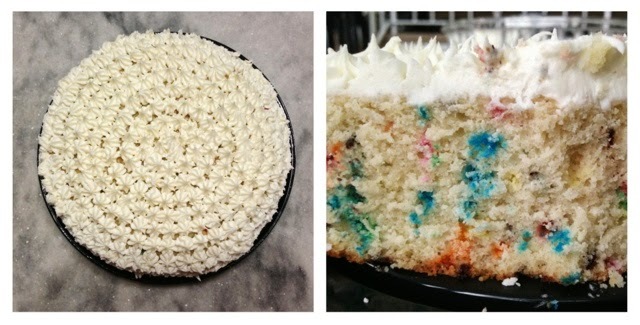 For her, I made a confetti cake. 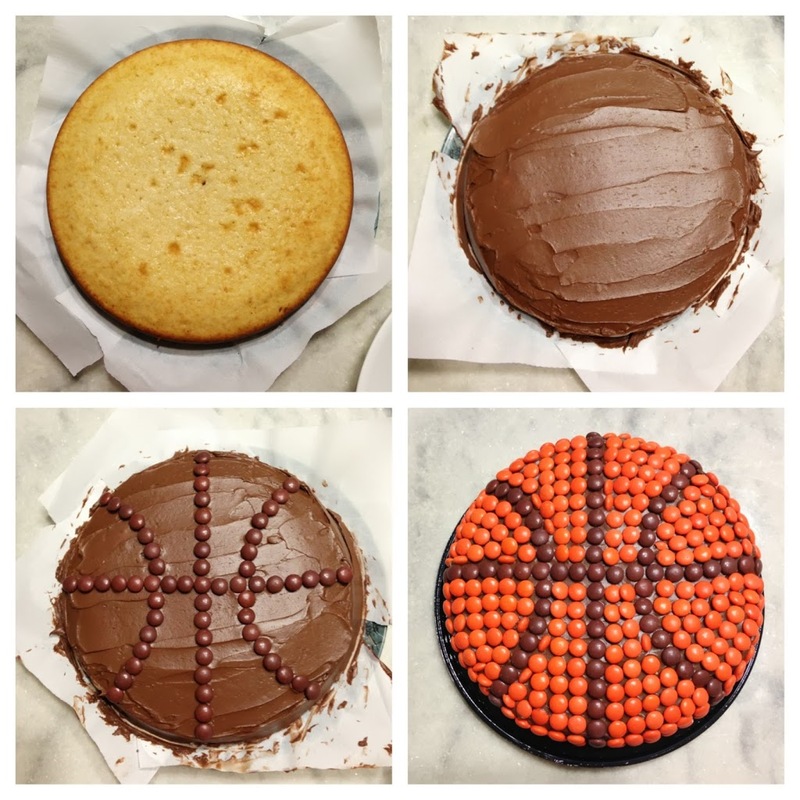 I used the same homemade yellow cake base recipe as I did for the basketball cake for Sabih, except I threw in some sprinkles into the batter. *Note: I wasn’t sure how well my decorating sprinkles would work inside the batter for the cake once it baked off — whether they would stay whole and clump, whether the colors would fade, whether it would just ruin the inside of my cake… you get the picture… so I tested out the sprinkles in one cupcake first and it worked wonderfully. Add in the sprinkles. Fold/Mix into the batter. For the frosting? I used store-bought creamy “classic vanilla” frosting today. From the [Oreo] Buttercream Frosting from this post back in April I learned my lesson the hard way: no more homemade frosting UNTIL I get a stand mixer. Why are they so darn expensive?! Would make my life so much easier! I used this fun decorating kit I bought a few months [called “Wilton’s Dessert Decorator Pro“] ago to decorate the top of the cake. I think my right hand and arm are still sore from it. No, I’m not talking about age. I’m talking about the clothing store. One that people my age shop at all the time. Their “store credit only” policy for returns? Their jewelry and accessories as being “final sales”? Stupid, I know. But I didn’t normally care or think twice about it because I don’t think I’ve ever returned anything there. I just shrugged it off as a smart sales technique on their part. If it’s store-credit only… then the consumer HAS to come back. Whatever. I shop there enough to not be bothered by that. I bought a black floral dress a few weeks ago that I love(d), love(d), LOVE(D)! This past Sunday, I finally had a chance to wear it. So I took the tag off (I don’t know ANYONE who doesn’t take the tag off before putting on the outfit itself), and loosened the ribbon/belt that goes around the waist. And what happens? The loop that the belt/ribbon/I-don’t-know-what-to-call-it goes through on both ends rips. Just like that. Well, gee, thanks. Next time, I’ll make sure to keep the tags on everything anticipating the product to be damaged AND dealing with such crappy customer service. Most customer service departments go out of their way to replace damaged good and/or offer a refund. Obviously Forever 21 isn’t one of them. Forever 21? Well, apparently it has the business sense of most 21 year-olds. Apparently I’m having a major sweet tooth lately. 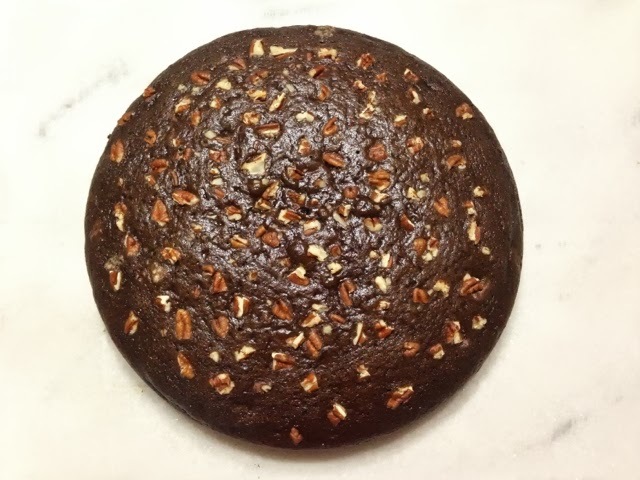 Today I made chocolate cake with pecans in it. Usually I don’t even like chocolate cake! Preheat your oven to 350 degrees. Spray [9 inch round] baking [spring-form] pan with non-stick cooking spray. In a mixing bowel, combine the flour, sugar, cocoa powder, baking powder, baking soda, and salt. Next, add in the vanilla extract, the water, and the melted butter. Mix all the ingredients together until everything is combined. Stir in about 1/3 cup of the pecans. Transfer your batter into your baking pan. Sprinkle your remaining pecans on top. Bake for about 25 minutes, or until a toothpick poked in the center comes out clean. The original plan when I suddenly decided to make the cake was to make a simple cake and frost it. Then suddenly, I found myself chopping up pecans for it. The end result? Too pretty to frost.